You just want to paint beautiful watercolors, it’s time to stop looking for inspiration and start creating for yourself ! Painting with watercolors should be fun, shouldn't it? You’ve tried to start painting. You bought supplies, got them all out on the table, pulled out a fresh sheet of paper...and all you feel is paralyzed. You’re trying to learn but don’t know if you should be practicing brush strokes or painting flowers to get better. You're frustrated with yourself because what comes out on paper is not what you had imagined in your mind. You’ve watched plenty of video tutorials but you’re still lost on how to work your palette and you have more questions than ever. You’re trying to piece together how to watercolor on your own, with no help. You wish someone would just guide you step-by-step in an order that actually makes sense, and that you had a way you could just ask questions when you need to. Imagine feeling confident in your ability to paint anything. 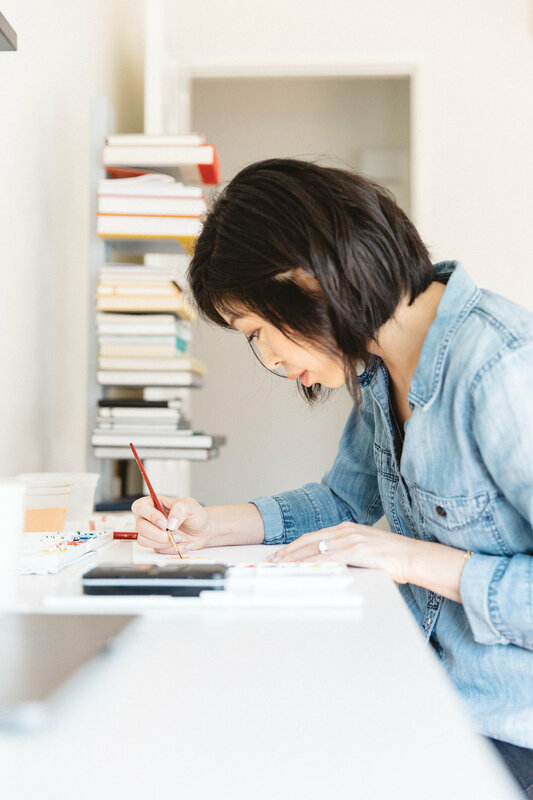 Think about how you’ll feel once you’ve built a solid foundation of knowledge, figured out when to use what technique, have a plan for the days you might feel stuck, and are overflowing with ideas that make you excited to paint everyday. You’ll finally have the confidence to share your work and and be proud of the progress that you’ve made. You’ll paint without worrying about other people being “better” than you. You will have a new hobby that brings you joy. You’ll rediscover the creativity that we all have inside of us. You'll be painting original art for yourself, your friends and family, and perhaps even customers! How do I learn with no experience? Can I learn watercolors if I can’t draw? How do I control the flow of the paint? How will I develop my own style? What if I’m not creative enough? What do I start painting first? I know there can be a lot of questions and confusion if you’re starting to watercolor for the first time. If you don’t have a plan to follow, it can be easy to start off on the wrong track, get frustrated, feel defeated, and completely give up on watercolors. Without guidance and support, it can be difficult to make progress and more importantly, develop your creative confidence! That’s why I created my step by step course, Just Watercolor! An online course that will build your foundation and creative confidence in watercolor. You have too many ideas and not enough time! We’ll review the supply checklist so you can purchase what you need based on your budget. We'll also chat about the best way to keep an open mind and enjoy the process of learning this beautiful medium! We’ll go into a detailed review of all the basic watercolor supplies and get your workspace set up so that you're ready to get painting! You’ll learn how to manage water while painting, the basic watercolor techniques and explore what your brushes can do. 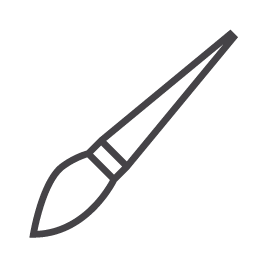 We will also review brush stroke exercises to practice control. We’ll go over basic color theory and learn all about color mixing. You’ll see how you can use a limited palette to mix up a spectrum of colors along with how to create depth and interest in your paintings. In this module, we'll look at the techniques and elements that make up watercolor paintings. I'll take you step-by-step through 3 application projects. Each project focuses on highlighting specific techniques and different ways of combining them to create finished pieces. We’ll take a look at everything we’ve learned, how it applies to anything you want to try and paint. You'll take a look at your own paintings and your unique natural style so that you can continue forward confident and excited to continue painting! 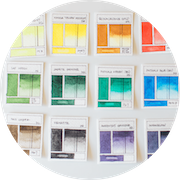 I’ll walk you through making your own individual color swatches, how to organize them, and create your own library of colors. You definitely don’t need to be able to draw to watercolor! But reviewing basic principles for sketching, composition, light and shadow, will give you even more confidence when painting. I'll give you a head start on 100 ideas to paint so you never run out! If you want to come up with your own, you can fill out the blank worksheet yourself! 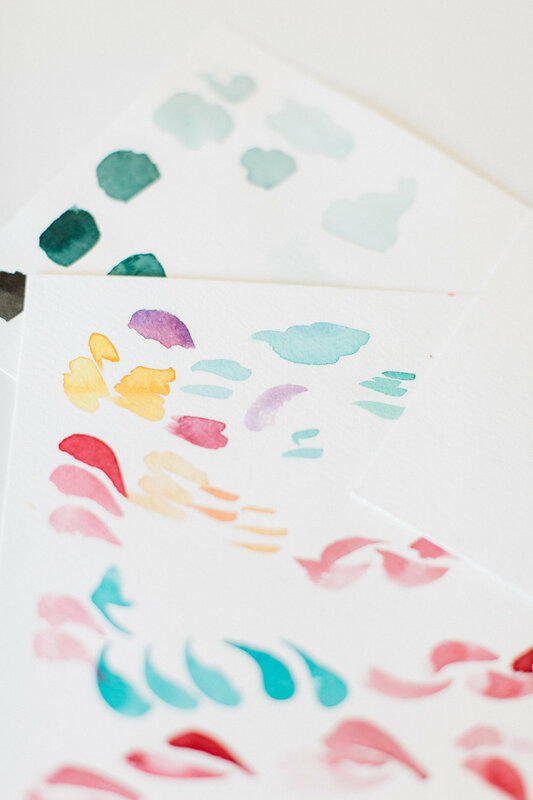 Start creating with watercolors today! This course will fit perfectly into your busy life. You can do this course from the comfort of your home, from anywhere in the world, and on your own schedule. 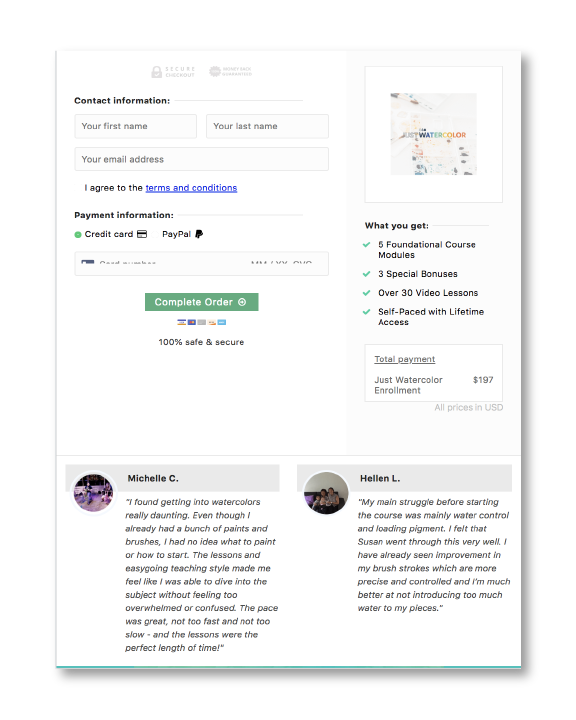 You can complete the course lessons from your kitchen table, home office or out on your patio, as long as you have an Internet connection! The entire program is completely digital and you'll never miss a thing: you can go at your own pace and do the lessons at any time of the day - whatever works with your schedule. There has never been a better time to start building your creative confidence in watercolors. If you wait, you’ll be in the same place you are now. And 6 months from now, you’ll wish you had started today! You consider yourself a beginner or "newbie"
You tried watercoloring but are frustrated because what’s coming out on the paper is not what was in your head. The course itself is 5 modules, each with a varying about of lessons contained within each module. Each module covers a foundational topic and is meant to take 2-4 hours each week. You can choose to follow along each week, or you can go at your own pace. The best thing about this online course is that you have lifetime access to the program. This means you can linger on certain lessons, take your time to practice and move on to the next one when you're ready. The course will always be there for you learn from! Deep down, we are all creative. This is a foundational watercolor course that helps anyone with a love of watercolors build strong skills and apply those skills to paint simple, but technique based paintings. Deep down, we are all creative. If you are rediscovering your creativity through watercolors, your passion needs to be nurtured. Anyone that is rediscovering their creativity needs to be gentle with their creative-self. If we aren’t careful to give ourselves the right tools, knowledge and time to learn, our creativity may crumble under the sudden pressure. Being kind to ourselves and setting realistic expectations is especially important when exploring watercolors - which has a reputation of being difficult. If you’re learning watercolors and have already run into feelings of disappointment or defeat, you will know what I mean. Watercolors should be a source of joy. There are many ways to paint in watercolors and we don’t need to be a “master” to love painting. In this course, you’ll learn the foundations and build your creative confidence with watercolors. You can keep searching YouTube videos, facebook groups, and Instagram tutorials on your own and possibly run into more and more frustration while attempting to paint things using techniques that you may not fully understand. You can let me guide you through building a foundation that will allow you to confidently approach watercolors. And when you're finished with the course, you'll find yourself feeling excited about painting new and more challenging subjects! But I don’t have enough time to practice and get really good. You don’t need to spend hours upon hours to paint a piece that you’ll be proud of. I’ll show you how even 20-30 minutes a day is all you need to continue improving your skills and feel good about taking time out for YOU. But I’m not artistic or creative. I can't even draw! 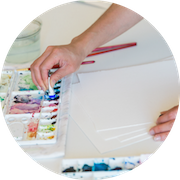 Even if you think you are not artistic or creative, this course walks you through watercolors in an easy to understand way. All you have to do is follow along, be open to making mistakes and continue practicing. Don’t worry, I’ll be there to support you along the way! But watercolor supplies are so expensive. We all have budgets we need to work with and I totally get it. That’s why this course is structured so that you don't have to own the entire art store to complete it! I even make suggestions for how to get by with the bare minimum supplies that only cost you $20. A few good quality supplies will get you far! I wholeheartedly believe in the “Just Watercolor” course. But I want you to feel confident in learning with me! That's why I have a 100% Risk Free Guarantee. You can try “Just Watercolor” for 14 days, and if you aren't satisfied, just ask me for a full refund. If you do the work, put in your best effort, and feel that I haven’t delivered, I will issue a 100% refund. When you click any of the "Enroll Now" buttons you'll be taken to a secure checkout page. After checking out, you’ll receive a welcome email with all the details and login information. Once you log in, you will have immediate access to start the course and any of the bonus lessons! The course can be taken at your own pace and begins and ends whenever you want it to! You have immediate access to all the lessons and bonus modules once you enroll. Yes! You have unlimited lifetime access for the life of the course. Meaning if I were to ever close the course in the distant future, you would be notified far in advance to allow time for you to complete any lessons and download any resources! What supplies will I need to take the course? Is this course different than your Brit+Co course? Yes! While the Brit+Co course is a great 1-hour long project-based course, this 5 Module foundational course really goes in depth into building a strong foundation in watercolor! It is truly step-by-step! Can I take the lessons anytime I want? Yes, all modules are available for viewing anytime you want. What projects will I paint in the course? This is a foundational course in watercolors. This means that all lessons are focused on laying the groundwork for you to learn watercolors through mixing colors, stroke exercises, and what I call "application projects". These projects are focused on applying what you've learned to small projects. We will combine everything you learned to paint a simple landscape. Keep in mind that this is not meant to be a subject-based course, but rather a course that is meant to establish your confidence, hone you basic skills and prepare you to have the confidence to continue painting your own projects in YOUR unique style! Each week you can expect the exercises to take anywhere between 2-4 hours (maybe longer if you get lost enjoying your painting time!) However, keep in mind there is no pressure for you to complete and turn in homework. This course is meant to make watercolors enjoyable - so move at your own pace, give yourself grace, and have fun! Do I have to be able to draw to take the course? Absolutely not! You can paint beautiful watercolors without being able to draw. In fact, it'd how I do most of my paintings and I'll show you how! If you're still feeling unsure, I go over basic drawing and composition in one of the course bonuses so make sure to watch that lesson before getting started with the course! You have 14 days to try out the course. If during this time you are unsatisfied with the course in anyway, please let me know and I'll issue you a 100% refund. Read the full refund policy here. How many lessons are in each Module and in what format? The number of lessons vary per Module depending on the topic. Each module is meant to cover a specific topic so that you are able to go back and reference the lessons easily (without having to scroll through a long video). Module 1, for example has 7 lessons. All lessons are video with audio consisting on a mix of live overhead and closeup shots as well as some slides. In total, there are over 30 lessons in the course! Hi, I’m Susan and I love creating with watercolors! I rediscovered watercolors early last year after 10+ years of trading traditional art for digital design and quickly realized that this was something that brought me joy and reignited my creative passion. My friends and family were surprised that I had this hidden talent and encouraged me to share, so I started teaching! 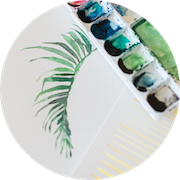 I’ve been answering all types of questions through my blog, email, and local workshops, but I knew I could reach so many more people looking to uncover their creativity with watercolors. I created this course because I believe we are all creative and everyone can find joy watercoloring with the right guidance and support. I’m excited to see what you create in the course!